Seems I’m bound to spend every bus ride trying desperately to hold in some bodily function; usually it’s needing to pee, but every now and then, just to shake things up, it’s needing to vomit. 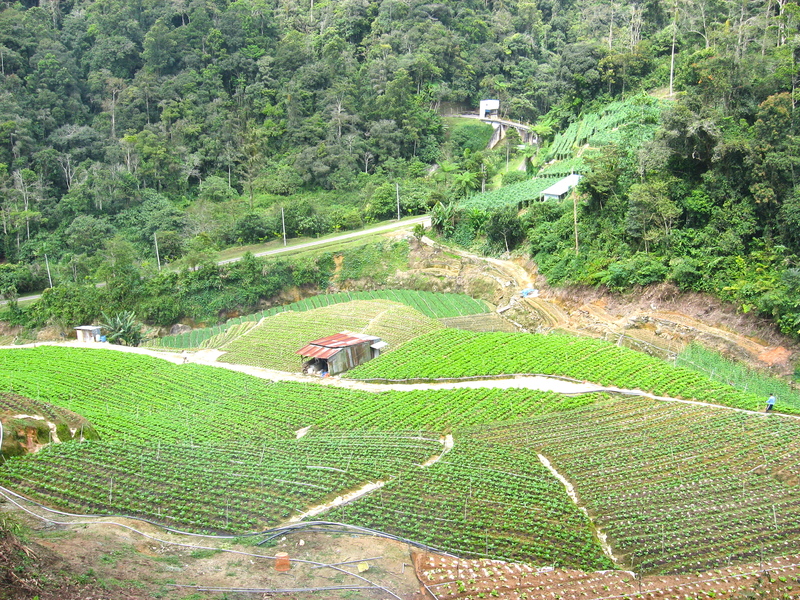 The bus trip to the Cameron Highlands was of this second type. The driver tore up the winding, mountain roads while every person on the bus squeezed their wrists, swallowed repeatedly, and tried to focus on the ever-changing horizon line. I made it, though. I was one of the lucky ones. Tanah Rata is the main backpacker town in Cameron Highlands. 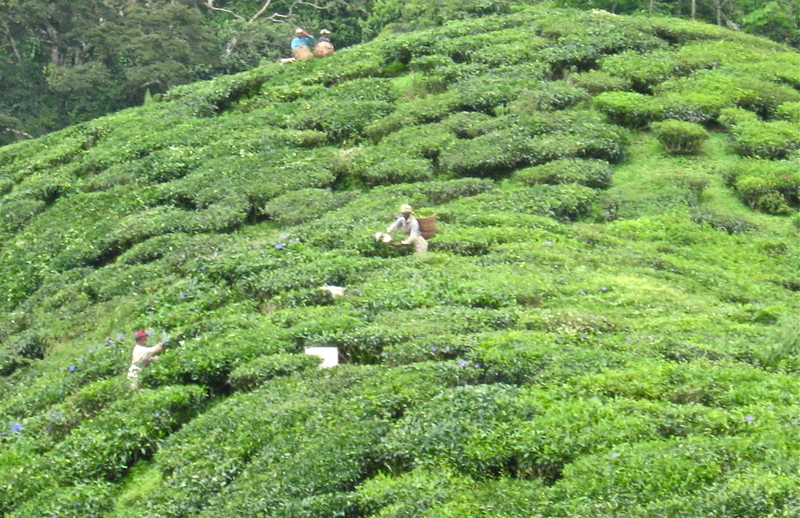 The surrounding hills are green and covered in either jungle or tea plantations. 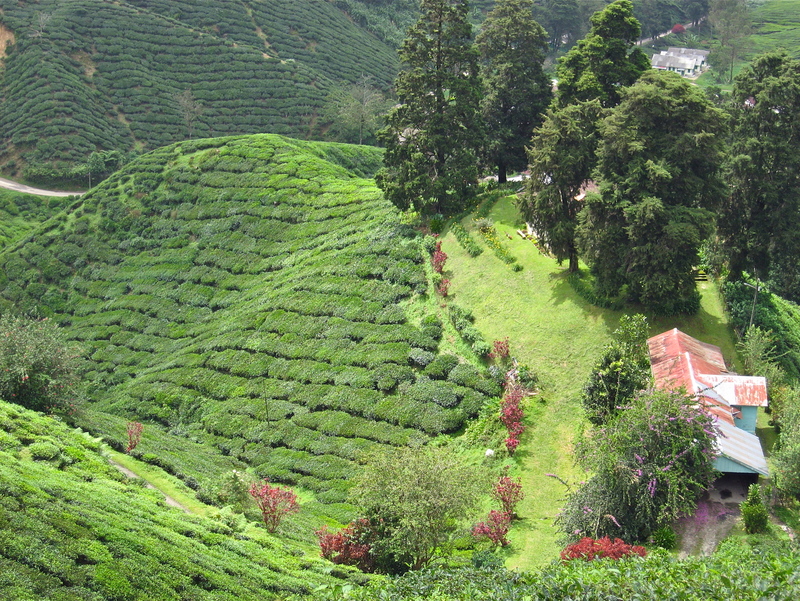 The symmetrical rows of tea bushes give a sort of aligator-scale texture to the hills they cover. Tanah Rata itself is a one-street town, and that street consists entirely of Indian restaurants and minimarts. Everyone in town knows exactly where you choose to eat breakfast, lunch and dinner, and for any restaurant you choose to patronize, you are sure to deeply wound the feelings of at least three other Indian owners, who don’t understand why the roti and chicken you had yesterday failed to bring you back. I stayed at Daniel’s Lodge, an extremely basic, hippyish backpacker run by the jovial, overweight Daniel, and two beanpole, identical fellows, Eddie and Gill, who are not actually related in the slightest, but who do accessorize with matching leather bands (Gill sells them on the main street some nights). 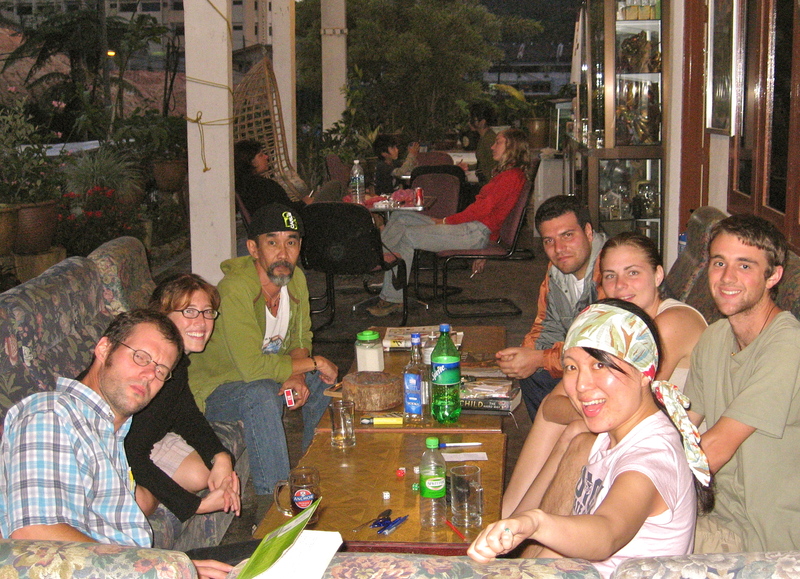 The afternoon I arrived, a group of travelers was playing cards on the front porch. They told me it had poured steadily for the past two days. I went to dinner with the four people I ended up hanging out with the whole time: an ATWC-Toronto, Peter and Lavana, who are just out of college and very mild and pleasant; a chipper Brit named Jeff, who’s working in New Zealand currently; and a Korean named Saemi (my only dormmate), who is studying tourism in KL, and who is forever being newly outraged at how little everyone seems to know about Korea. After dinner, we returned to the hostel: there’s a fire out back every night, which everyone sits around while Gill plays folk songs on the guitar (mostly Tracy Chapman). Luckily for me, the weather cleared up entirely the morning after I arrived, and was both sunny and cool for my hike. I’d picked an easy, introductory jungle trail, and was excited to walk along quietly in the woods, in contemplation of my life and its direction. On my way to the trailhead, however, I ran into an older Indian fellow, who I soon realized was this guide, Kali, who everyone uses when they need a guide. He’s said to be the greatest guide ever; he’s friendly and knows the Highlands up and down; he’s 64, though he doesn’t look it, and hikes every, single day; people pay him a lot of money to hike with them; and I was extremely annoyed when he decided to tag along with me for free. He was nice enough, and sure, it’s great to have a guide and all, but I just wanted to walk along and think and listen to the birds, and instead, I was directed to look at millipedes and various plants, my palm was dyed with henna, and both my wrists were encircled with bracelets made of rattan. 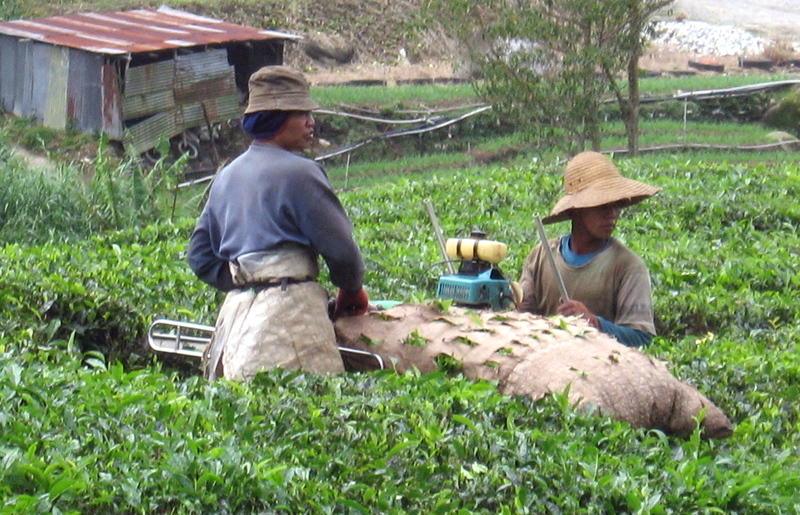 At the end of the jungle trail, we parted ways and I continued up the hill to the Boa Tea Estate, the biggest tea plantation, and had a very nice walk winding around the tea hills on a little goat trail. Next day (Christmas Eve day and again, gorgeous weather), I picked the second highest mountain to hike and was walking to the trail head when I saw Kali going along in front of me. I jagged off the road and waited about ten minutes, before proceeding cautiously on my way. No sign of Kali anywhere and then, just as I reached the trail head, he popped out of nowhere from the other direction. It was a long day. After my initial annoyance wore off and I accepted the inevitable, I quite enjoyed Kali’s company. He wanted to know if I still had my bracelets and, even though I told him I did (liar), he made me another one. And dyed my hand with henna again. After we hiked the mountain, we headed back to town by several other trails, including a closed one that Kali made himself that hops over several creeks. We hiked quickly and got back to town by early afternoon, but it was a long way, and I was exhausted and ready for naan. Kali left me to go hike another trail. That night was Christmas Eve. Levana and Peter had somehow managed to find a Protestant church service in the next town (they’re very wholesome), and Saemi and I went along. The service was in a meeting room on the eighth floor of a hotel, and the pastor ushered us right in, sat us front and center and sat down to tell us about himself. The pastor is a large, very Western Indian man who looks a bit like Colin Powell. He was raised a Hindu (‘I used to put the hooks in my cheeks and everything!’), but became a Protestant minister in 2001. After half an hour or so, the rest of the congregation poured in: all Chinese and Indian, with the Indian women all in traditional dress. Everyone was extremely friendly and welcoming. An Indian family sat at our table; the father asked Saemi where in China Korea was located. We sang hymns for about 45 minutes, standing and with a lot of chanting, clapping and raising of hands in between the hymns (the four of us, meanwhile, stood whitely, hands pinned to our sides, eyes pasted to the lyrics, lips moving minimally). After hymns, each of about five families gave a ‘presentation.’ These were mostly songs; the biggest hit was the pastor’s model-gorgeous daughter who sang a Christian rock song, accompanying herself on the guitar. Throughout the whole thing, everyone’s kids screamed and cried and ran around, making it really difficult to focus. They were especially riled by the time the sermon finally began, which was on how nothing is impossible with Jesus. The pastor was very enthusiastic, but he went on about 30 minutes too long, especially since dinner was sitting to one side waiting to be served, and the kids had actually strapped on roller skates and were zooming around the tables. But the sermon wasn’t over until the pastor had spent a good fifteen minutes reading a collection of Mother Theresa quotes, which didn’t seem to relate to the sermon at all. After that, we had dinner, followed by an interminable gift exchange (the four of us were given picture frames, which we in turn gifted to Daniel’s as they wouldn’t fit in our packs), and at 11:00, the party broke up. We all felt it had been a very nice Christmas Eve. On Christmas day, I did not hike. I lounged around the hostel, rousing myself for meals at various Indian restaurants. When night fell, I moved over slightly to lounge by the fire. In honor of Christmas, Saemi and I went halvsies on a bottle of (really bad) red wine. It was a great Christmas altogether. 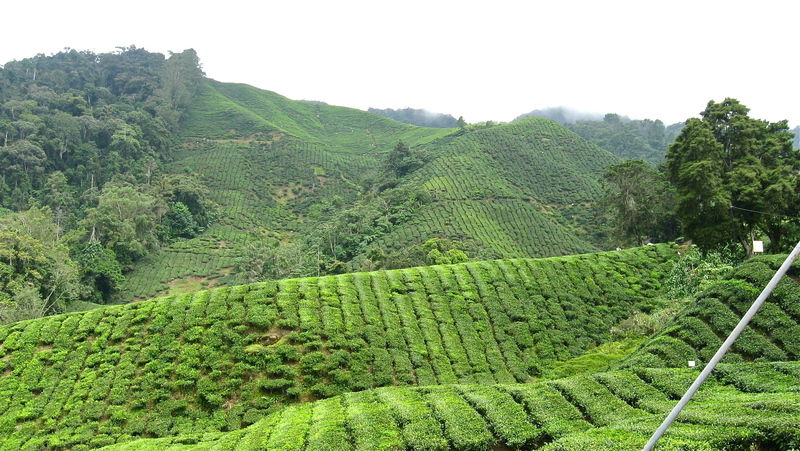 If you ever have occassion to be in Malaysia over the holidays, I recommend heading to Cameron Highlands. Especially because, if it’s anything like this year, all the lowlands will be flooded anyway.